"I put myself through Hell participating in some of the most difficult athletic changes in the world, but they are still challenges I choose to chase. When I think I can't go any further, or endure any more pain and suffering, I think of Bennett and his family, and the challenges they experience. All of a sudden, my problems pale in comparison, and fight to complete the challenge for both me and Bennett." "Bennett is an outgoing, curious, funny, and sweet five year old. He loves all things Legos, Shopkins, and Pokemon Go. He loves telling "jokes" and going on adventures outside with his big brother. He jumps and flaps his hands when he is excited, and he hums when he needs a break. Bennett likes to wear hats and hoods. He loves routine, rules, calendars, and schedules. He likes to learn facts and share them with people. He doesn't always make eye contact or know how to play the way other kids his age play. Bennett is confident and assertive. Bennett has Autism. He has been in therapies inside and outside the home, multiple times a week, since before he turned two. Bennett has many challenges, but has even more strengths and successes, because Bennett is a warrior." 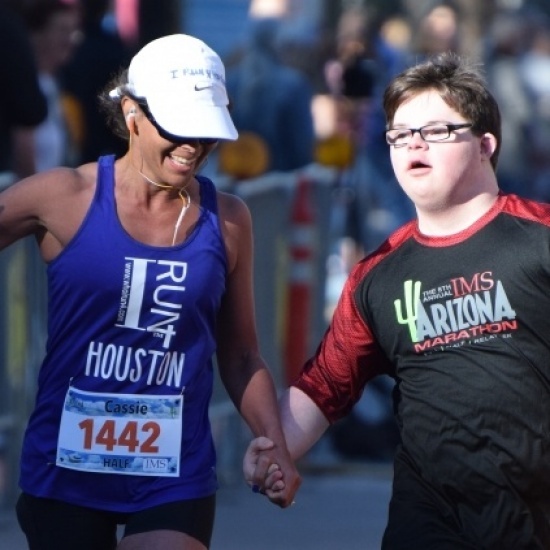 Launched as a private group of 10 runners and buddies with special needs (20 total) who shared workouts and health updates in a private setting, IR4 rapidly grew to over 22,000 members and nearly 7,000 matches, with 3,500 athletes waiting, within 18 months. interested in running for someone? Visit i Run for Michael.